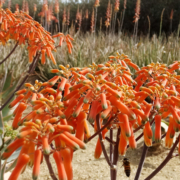 During long years of drought, homeowners were urged to replace thirsty lawns with drought-tolerant plants native to California, and plants from similar Mediterranean climate zones. Now the drought is officially over, but we have another worry: wildfires. Do drought-resistant plants burn more easily? Are we left with the wrong kind of gardens? The answer is: not really. Hydration makes plants are more fire-resistant, and drought tolerant plants, especially California natives, stay hydrated with less water and hold onto it longer than plants that originate in moister places. Plants to remove or avoid are those that shed bark or are fast growing. Also, plants that have a lot of wax, resin, oils, terpenes, or fats, such as chamise, rosemary, and sagebrush.